New York: Harper & Row, Publishers, 1978. 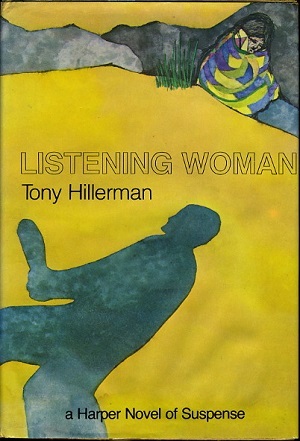 This is the first edition of Listening Woman. Published in hardcover in 1978 by Harper & Row in New York City, New York. Nominated for the Edgar Allan Poe Award for Best Novel (1978). Format: Hardback, 21 x 14.5 cm. Binding: Light yellowish cloth-covered boards, medium yellow cloth spine lettered in black, full-color illustrated paper jacket designed by Frank Bozzo.